Produktinformationen "Advanced Chemistry with Vernier"
Advanced Chemistry with Vernier has 35 advanced chemistry experiments designed for use with Vernier data-collection technology. There are four student alternative versions included for each experiment: computer, LabQuest, calculator, and a generic version that covers all platforms. Experiments are included for the Vernier Temperature Probe, pH Sensor, Conductivity Probe, Drop Counter, Colorimeter, Gas Pressure Sensor, Current Probe, ORP Sensor, and Radiation Monitor. 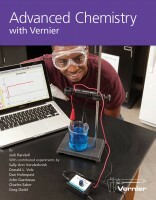 Weiterführende Links zu "Advanced Chemistry with Vernier"
Garantie(Jahre) "Advanced Chemistry with Vernier"
Weitere Info "Advanced Chemistry with Vernier"
Kundenbewertungen für "Advanced Chemistry with Vernier"